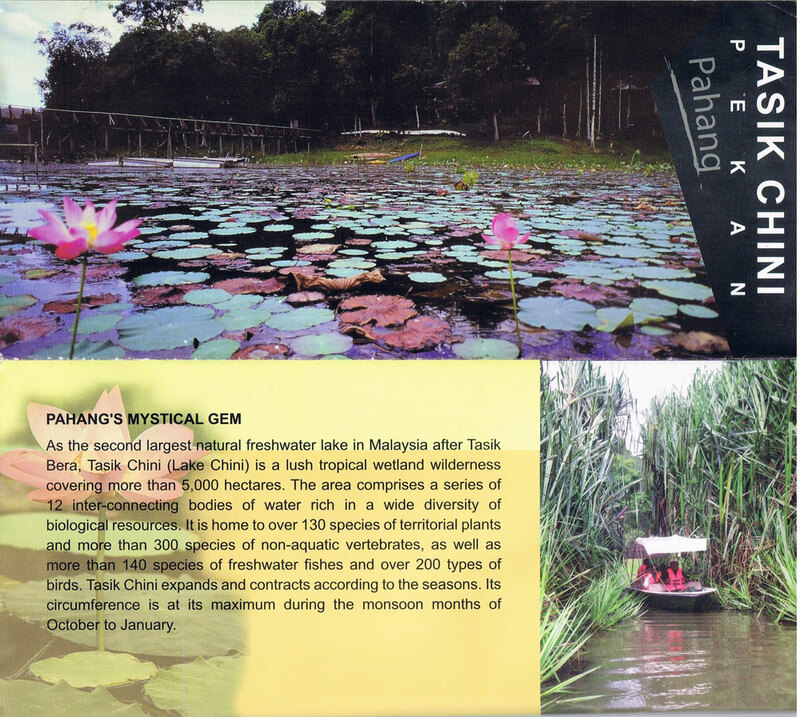 As the secornd largest natural freshwater lake in Malaysia after Tasik Bera, Tasik Chini (Lake Chini) is a Iush tropical wetland wilderness coveringmore than 5,000 hectares. The area comprises a series of 12 inter-connecting bodies of water rich in a wide diversity of biological resources. lt is home to over 130 species of territorial plants and more than 300 species of non-aquatic vertebrates, as well asmore than 140 species of freshwater fishes and over 200 types of birds. Tasik Chini expands and contracts according to the seasons. Its circumference is at its maximum during the monsoon months of October to January. 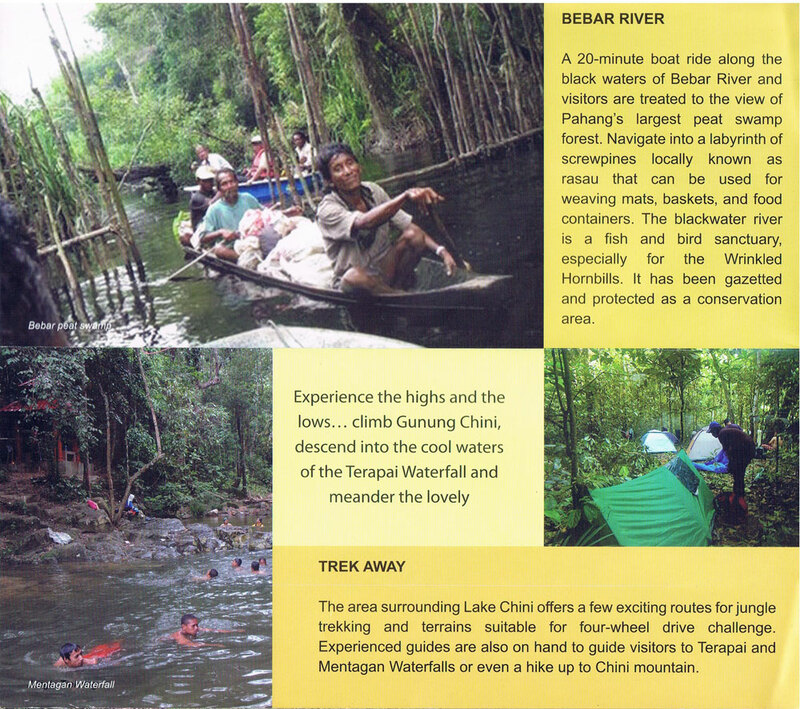 Go on an exciting river safari or chose from a range of boating activities and discover what makes Tasik Chini a great natural destination. The water interchangeably overflows into the network of lakes, nurturing and perpetuating a healthy natural growth of delicate flowering white and pink lotus (Nelumbo nucifera). This veritable enciave of over 200 hectares of open water and 700 hectares of freshwater swamp and swampy forest is a haven for anglers bent on landing the ferocious ‘toman‘ (snakehead), ‘tapah‘ and the prized arowana. These species abound from November to January, when the torrential monsoon rains increase the size and depth of the lake. 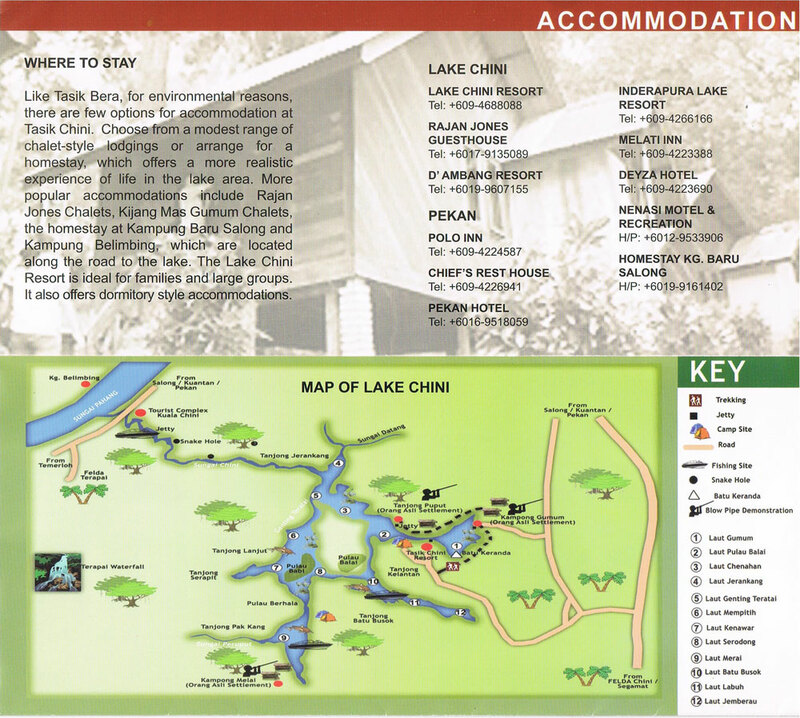 Like Tasik Bera, for environmental reasons, there are few options for accommodation at Tasik Chini. 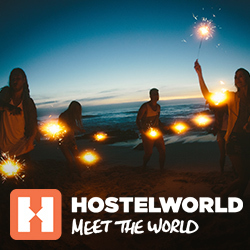 Choose from a modest range of chalet-style lodgings or arrange for a homestay, which offers a more realistic experience of life in the lake area. More popular accommodations include Rajan Jones Chalets, Kijang Mas Gumum Chalets, the homestay at Kampung Baru Salong and Kampung Belimbing, which are Iocated along the road to the lake. The Lake Chini Resort is ideal for families and large groups. lt also offers dormitory style accommodations. Kuala Chini or direct to Lake Chini. Kuala Lumpur, head towards Kuantan via the Karak Highway. 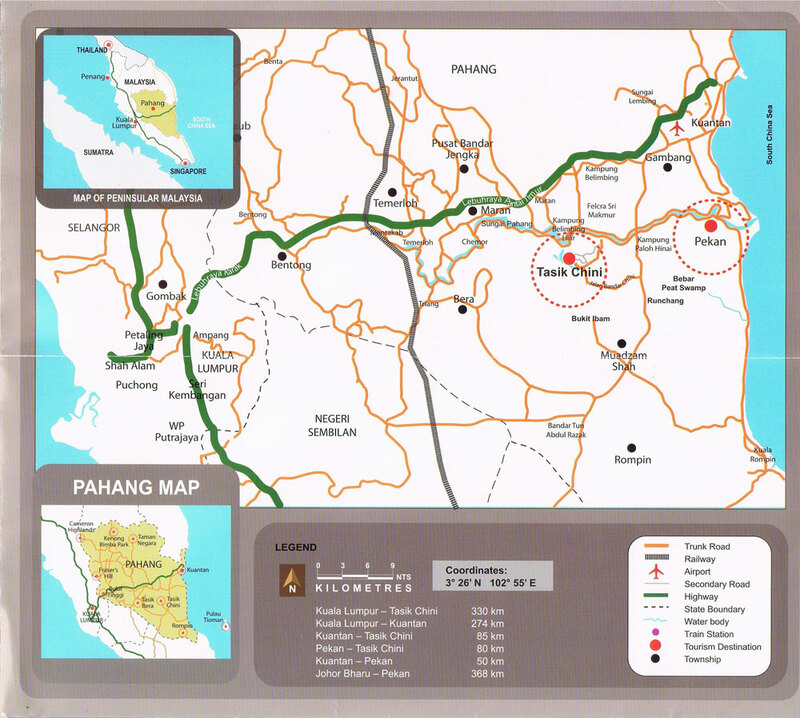 Pekan town is approximately 300 km from Kuala Lumpur. 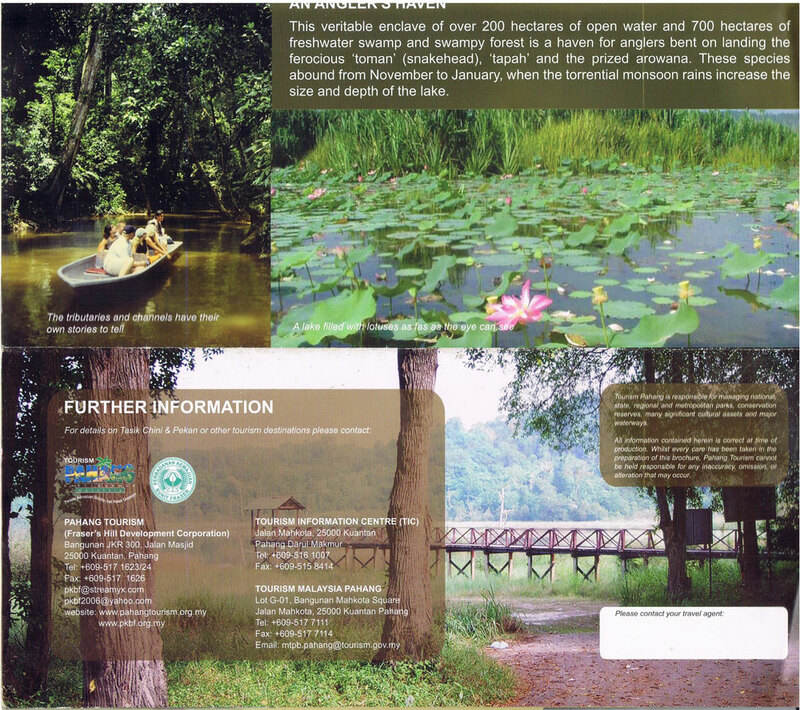 Universiti Kebangsaan Malaysia‘s field station at Tasik Chini is a research hub dedicated to the preservation and monitoring of the ecological site. The centre is a one-stop centre for conservationists and for visitors looking for more information about the lake and its flora and fauna. 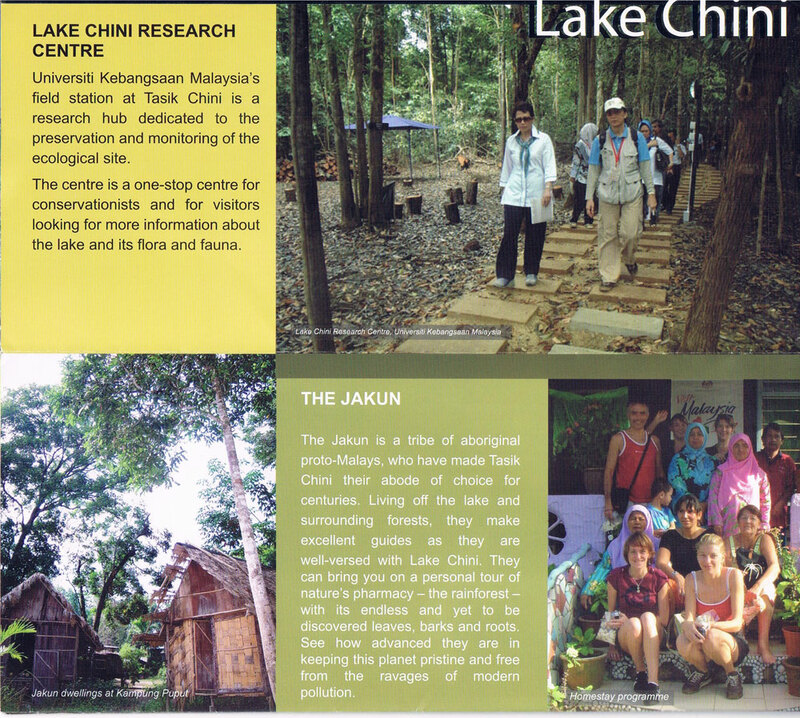 The Jakun is a tribe of aboriginal proto-Malays, who have made Tasik Chini their abode of choice for centuries. Living off the lake and surrounding forests, they make excellent guides as they are welI-versed with Lake Chini. They can bring you on a personal tour of nature‘s pharmacy — the rainforest — with its endless and yet to be discovered leaves, barks and roots. See how advanced they are in keeping this planet pristine and free from the ravages of modern pollution. To experience what it feels like to live by the river, opt for a stay at Homestay Kampung Baru Salong, situated on the southern bank of the Pahang River. 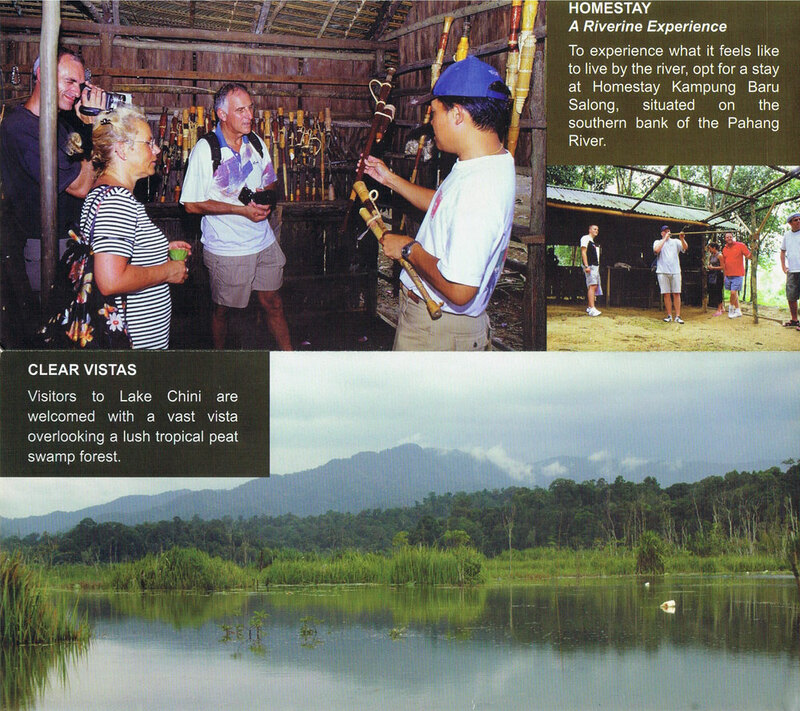 Visitors to Lake Chini are welcomed with a vast vista overlooking a lush tropical peat swamp forest. 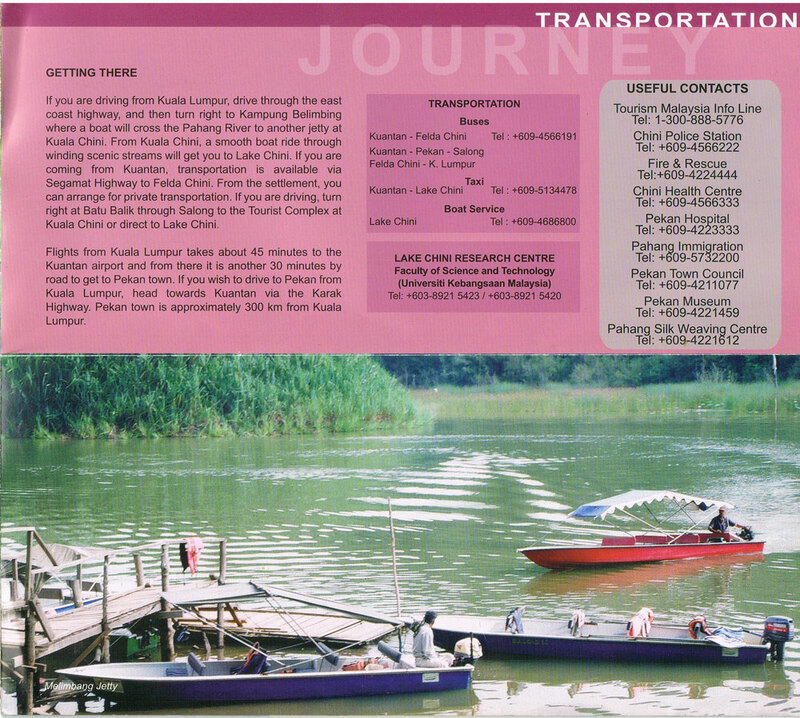 A 20-minute boat ride along the black waters of Bebar River and visitors are treated to the view of Pahang‘s largest peat swamp forest. Navigate into a labyrinth of screwpines locally known as rasau that can be used for weaving mats, baskets, and food containers. The blackwater river is a fish and bird sanctuary, especially for the Wrinkled Hornbills. lt has been gazetted and protected as a conservation area. The area surrounding Lake Chini offers a few exciting routes for jungle trekking and terrains suitable for four-wheel drive challenge. 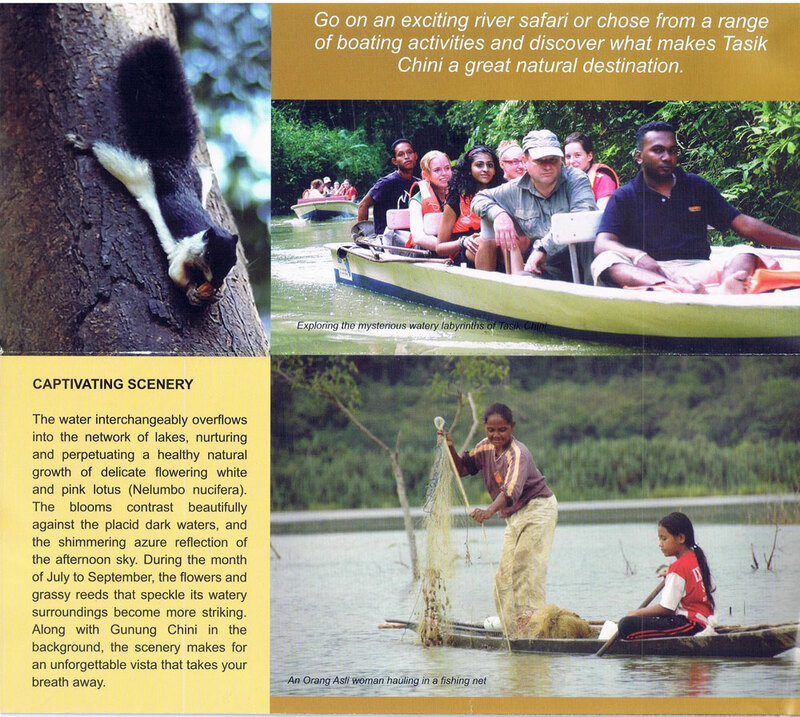 Experienced guides are also on hand to guide visitors to Terapai and Mentagan Waterfalls or even a hike up to Chini mountain. and its royal lineage is displayed in two huge halls that was formerly one of the royal palaces. Located 50 kilometres south of Kuantan, this quaint town is rich in culture and heritage. Despite its diminutive size, the place offers much to explore and discover. View the Sultans palace, and the sprawling field next to it that was designed to accommodate the favourite sport of Kings — polo. The giant statue of a polo player on his horse that sits squarely at the edge of the precinct is representative of how dedicated the royal family is to the garne. Visit the royal stables and the Sultan Abu Bakar Museum to fiu up on the history of Pahang and its much-Ioved rulers. 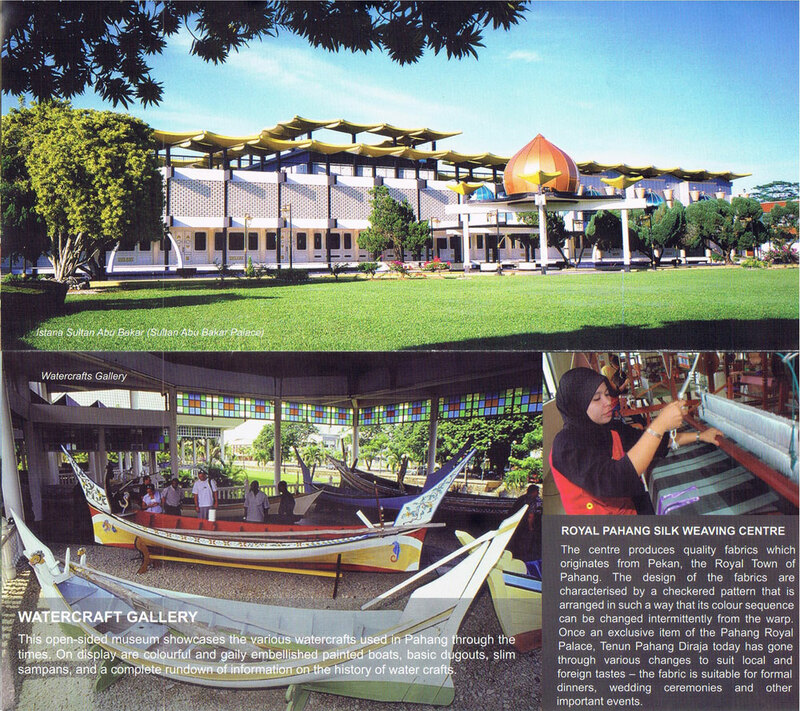 Spare some time to browse through the Watercrafts Gallery and observe the making of fine Royal Pahang Silk at the Galeri Tenun Pahang Diraja. 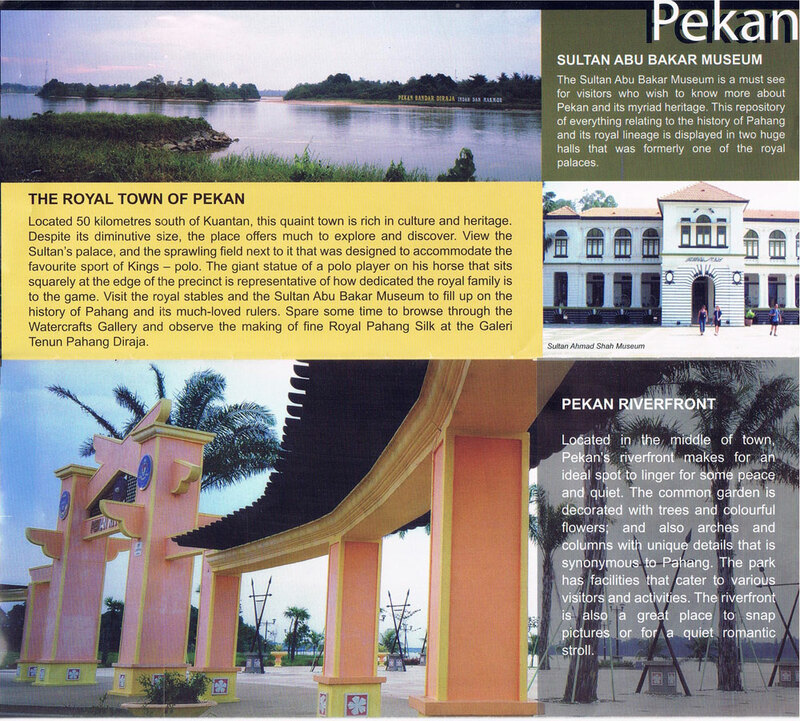 Located in the middle of the town, Pekan's riverfront makes for an ideal spot to linger for some peace and quiet. The common graden decorated with trees and colourful flowers; and also arches and columns with unique details that is synonymous to Pahang. The park has facilities that cater to various visitors and activities. The riverfront is also a great place to snap pictures or for a quiet romantic stroll. 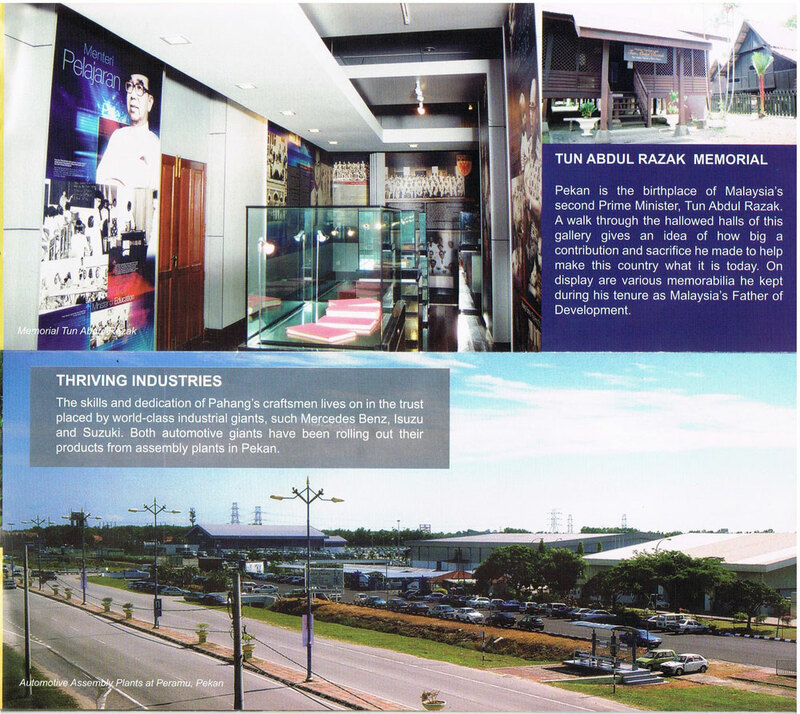 This open-sided museum showcases the various watercafts used in Pahang through the times. On display are colourful and gaily embellished painted boats, basic dugouts, slim sampans, and a complete rundown of information on the history of water crafts. The centre produces quality fabrics which originates from Pekan, the Royal Town of Pahang. The design of the fabrics are characterised by a checkered pattern that is arranged in such a way that its colour sequence can be changed intermittently from the warp. Once an exclusive item of the Pahang Royal Palace, Tenun Pahang Diraja today has gone through various changes to suit local and foreign tastes — the fabric is suitable for formal dinners, wedding ceremonies and other important events. Pekan is the birthplace of Malaysia‘s second Prime Minister, Tun Abdul Razak. A walk through the hallowed halls of this gallery gives an idea of how big a contribution and sacrifice he made to help make this country what it is today. On display are various memorabilia he kept during his tenure as Malaysia‘s Father of Development. The skills and dedication of Pahang‘s craftsmen lives on in the trust placed by world-dass industrial giants, such Mercedes Benz, lsuzu and Suzuki. Both automotive giants have been rolling out their products from assembly plants in Pekan.